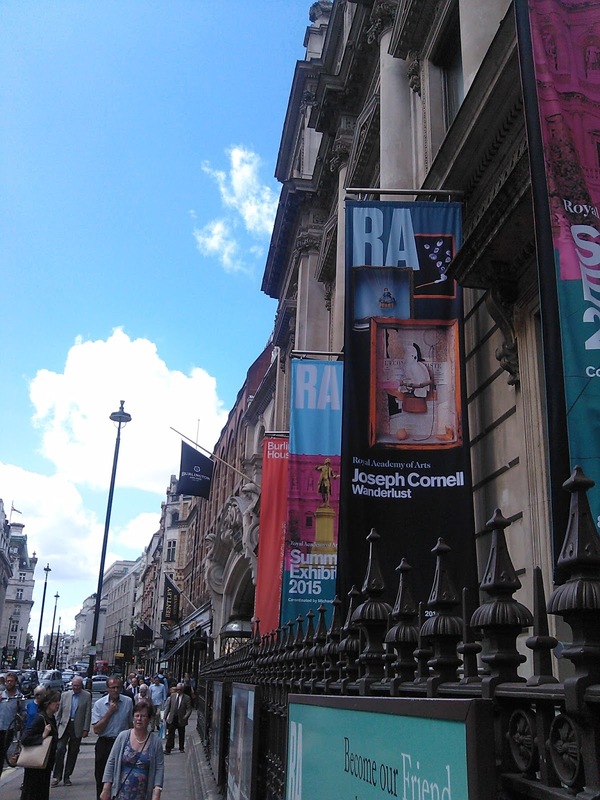 As I mentioned yesterday, I am on day two of a three day art course called Inspired by Joseph Cornell. 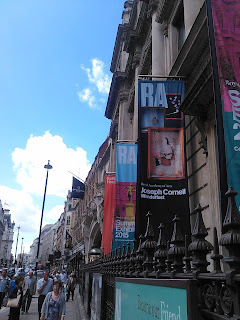 Today we went to see the exhibition of some of his work at the Royal Academy of Arts. The exhibition is entitled Wanderlust which is an interesting choice as he was something of a recluse and didn't travel far from his home in New York during his whole life. However, he was obsessed with the idea of travel and collected photos, stamps, magazines, postcards - all kinds of items. He was also a very intelligent man who read widely so knew a lot about the world. I really enjoyed seeing the work at the exhibition. This was my favourite piece that I saw today. The work is smaller than I had imagined and the strings are so precisely threaded. In the afternoon we went back to the Centre and continued working on our own boxes inspired by Cornell. Yesterday I had a mini crisis about wanting my work to be good but I'm over that today! I've decided to just have a go and see what happens. It's quite a psychological leap to make. We always want to do our best but when we're learning we just have to have a go, otherwise we'll never learn and improve. That's been a useful lesson and something to remember to highlight when I am teaching my own students as they can often get stuck trying to be good.